The Echoes of a Proud Nation Pow Wow was originally established in 1991 to bring people together to share in a native spiritual celebration of life through drumming, song and dance; to come together to renew old friendships and make new ones. Whether you come from far or near, we are honored that you have chosen to come to our territory and we welcome you! The Pow Wow is a family oriented event and and a great learning experience filled with a multitude or colorful sights and sounds. We encourage you to enjoy yourself and browse the numerous traditional craft booths and feast on the wide variety of native cuisine. 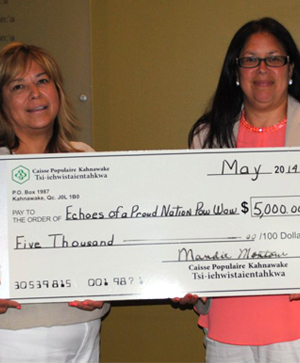 The Echoes of a Proud Nation Pow Wow is made possible thanks to the collaborative partnerships with a variety of community organizations and local businesses who provide their support through financial contributions and services. We’d also like to recognize the many dedicated volunteers who devote their time and energy to making this a special event for everyone to enjoy. We thank the community of Kahnawake for 28 years of continued support.